Fig. (1) Expression of tagged L polymerases. (A) Schematic representation of the RSV L polymerase showing the two variable regions VR1 and VR2 (open boxes) identified after amino acid sequence alignments of the L protein of BRSV (strain ATue51908 ; accession number NC_001989.1) and HRSV (strain Long ; accession number P28887.1). A SalI site was generated within the VR2 region by site directed mutagenesis and used for insertion of either an HA tag, eGFP or mCherry ORFs between L amino acid residues 1738 and 1739 (arrow). The GDNQ catalytic site of HRSV L is indicated. Amino acid positions are given in parenthesis. (B) Expression of eGFP-L, mCherry-L, and HA-L polymerase alone in BSRT7/5 cells. Arrows indicate cells expressing L-tagged proteins, which present condensed nuclei. (C) Co-expression of L-tagged polymerases with P. Cells were fixed 24 h post transfection. 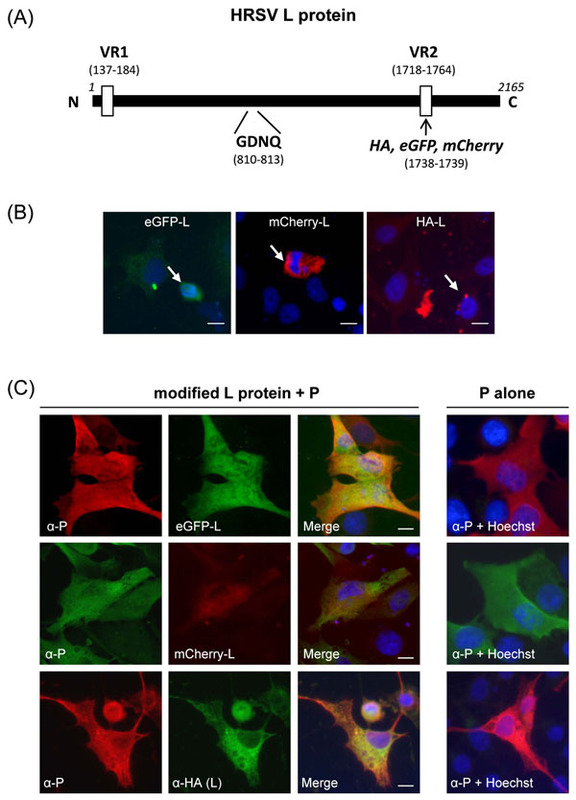 eGFP and mCherry were visualized by virtue of their own fluorescence, HA-L was labeled with anti-HA antibodies (green), and P with anti-P antiserum (red or green). Nuclei were stained with Hoechst 33342 and are shown in the merged pictures. Scale bars, 10 µm.